As the saying goes: Behind every successful scam there is probably an even more successful influencer. When the news broke that some 50 people, including actresses Lori Loughlin of Full House and Felicity Huffman of Desperate Housewives, had been charged in the largest college admissions swindling in the history of the United States, many were quick to highlight that Loughlin’s daughter, Olivia Jade Giannulli, had been posting videos about her experiences at the University of Southern California on YouTube, which reached her almost two million subscribers daily. According to court documents, Loughlin and her husband, Mossimo Giannulli, agreed to pay bribes totaling $500,000 in exchange for having their daughters designated as recruits to the USC Crew team, despite the fact that they did not participate in crew, thereby facilitating their admission to USC. Olivia Jade, along with her older sister Isabella, who also goes to USC, are not completely to blame for their parents’ scandalous ways. According to reports, some students claim to have been unaware of their parents’ wrongdoings and are not being legally prosecuted. That did not, however, leave them completely untouched in light of this scandal. Olivia Jade has not been charged, but she has felt the fallout. Sephora, which sold Olivia Jade Makeup on its website, severed ties with her after the indictment was announced. The Hallmark Channel, where Loughlin starred in the popular holiday movie, as well as the series “When Calls the Heart,” cut ties with her a day after her arrest. 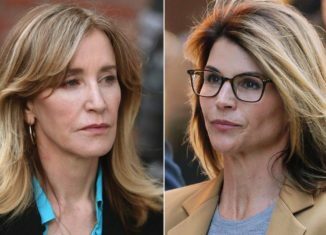 Actresses Lori Loughlin and Felicity Huffman are expected in court to face the charges that they participated in a wide-ranging college admissions cheating scam. Dozens of others also paid an admissions consultant to bribe college coaches and rig test scores to get their children into elite universities. Many have not publicly commented on these allegations. Other parents are scheduled to make their first appearances in Boston’s federal court. Hopefully, this scandal will bewake-up up call to not only parents around the world, but also to their kids to do the right thing and to play by the same rules. Things that should be earned by dedication and hard work should not be bought with money. The college admissions scandal is shaping up to have long term problems for both the parents accused in the scheme and the large world of acceptance into college. US Secretary of Education Betsy DeVos said, “Every student deserves to be considered on their individual merits when applying to college and it’s disgraceful to see anyone breaking the law to give their children an advantage over others.” Only time will tell how those involved in this scandal will be punished, and if their misdeeds will impact the college admissions process for all of us going forward.